If you enjoy the occasional police procedural, you could do worse than to pick up a copy of “The Rage,” a well-written and deftly plotted story set in Dublin in 2010. The book’s chapters alternate between the experiences of its two main characters. One is Bob Tidey, a middle-aged Garda (police) detective whose life and career aren’t as he expected them to be. The other is Vincent Naylor, a young thug fresh out of jail with a short temper and an itch to pull off a big heist. Well, what’s this about, you think to yourself. So you turn to the first chapter, and the clock is wound back to describe how Tidey’s conundrum arose. Meanwhile Naylor and his pals find a security man with a drinking problem and detailed knowledge about the cash collection practices of a large company. They blackmail him and use what they learn to devise an intricate plot. Other elements and characters are sketched into both men’s stories — Garda officers, family concerns, an aging nun who sees something and says something, a reformed hood whose son is up to no good, and a bordering-on-stereotypical annoying reporter. (Reporters are helpful in crime stories because they talk to various involved parties and share information via their publications.) All play their roles in moving the action along. Author Gene Kerrigan is himself a longtime Dublin newspaperman, and his story’s settings provide some interest for people who have visited the city or been accompanied/dragged through James Joyce’s “Ulysses” in a college class. 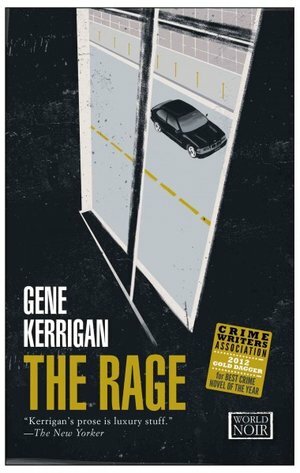 “The Rage” is Kerrigan’s fourth book. It won the Golden Dagger prize for the U.K.’s best crime story of 2012. * Evil bankers are stock characters in fiction and film, particularly since the Great Recession. They are particularly resonant in this book, whose full title, “The Rage (World Noir),” reflects the mood in Dublin in 2010. 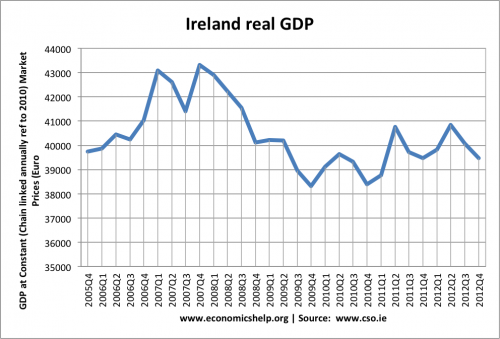 Here’s a quarterly GDP chart for Ireland in the relevant period. The low point is the fourth quarter of 2009. Ireland’s history since the mid 19th century was bleak. A famine that began in the mid 1840s starved at least a million Irish and led to the emigration of millions of others. I read once that the sons of famine survivors who came to New York grew six inches taller than their fathers. The Irish economy remained sluggish for almost 150 years, a period when generation after generation young Irish adults left the country in search of better prospects. Fortunately for them, they were able to settle in other Commonwealth countries. Around 1995, things began looking up. International businesses located in Ireland, which spurred domestic business development and rising real estate values. GDP grew rapidly, and the young people stayed home. For a while, Ireland was called the Celtic Tiger. Then came the crash, which must have awakened national memories and dread. It is not surprising that a journalist like Kerrigan would weave this into a novel of that moment.